Center Stage Dance is celebrating it’s 20th year of dance instruction. 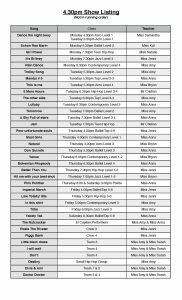 The following information is for you to locate which performance(s) your child is in on Recital Day. 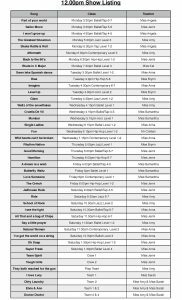 The information is listed in class order for the week. It is important that you know the correct call time for your child’s show and also which performance to purchase tickets for. Information about the running order of each show will be posted at a later date for anyone with costume changes so that you will know which costume to arrive in and the order of those changes.